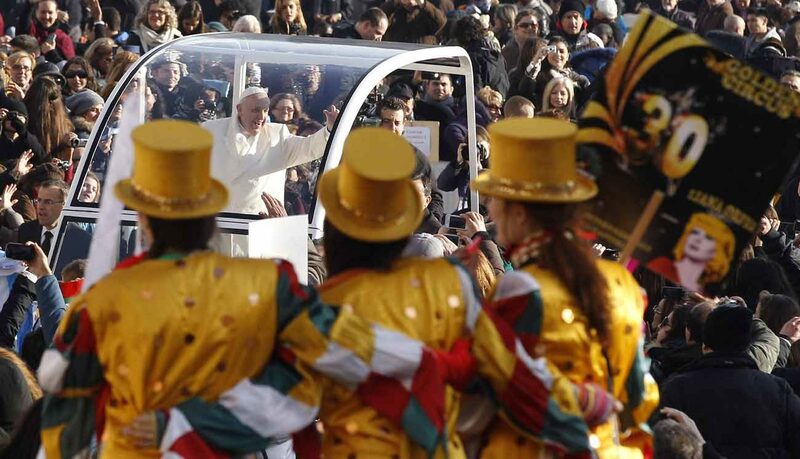 VATICAN CITY (CNS) — Meeting with an association of traveling circus and street performers, carnival workers, musicians and magicians, Pope Francis thanked the artists for their dedication in bringing joy to men, women and children. The “joyful vocation” of entertaining people of all ages is also a mission to provide “healthy and clean fun without the need to go low to look for material to entertain people,” the pope said during a Sept. 15 audience with Italy’s National Association of Traveling Performers. “Do not be discouraged, continue on your path so that our cities and our countries do not lose the taste for this peculiar beauty through your presence, your art, your joy,” he said. Recalling his meeting with them during the Holy Year of Mercy, Pope Francis encouraged the artists to continue being “artisans of celebration, wonder and beauty” so that, through their work, they could nourish “feelings of hope and trust” in others.